Well here in Lima I have been trying to scare up some work and meet/ingrain myself into the art scene. A few posts ago I wrote about an art project here called 'AFUERA' that was to take place in Pisco a costal town about 2 hours south of Lima. I got in touch with the organizers and offered my services if they needed any help. Turned out they needed some editions printed, more on this in my next posting, made of a few of the participating artists namely Jade and Decertor. These guys are two well know muralists and street artists here in Lima. I thought this would be a cool project so I jumped aboard. Myself and a few friend headed down to Pisco for the 'AFUERA' event. We arrived in Pisco and were expecting to be able to find the 'art' very quickly but as it turned out a bit of sleuthing was needed. Even though I had been told by the organizers that Saturday was the day to come down we had showed up a one day too early. No problem some of the work was up and we took an impromptu tour of Pisco. 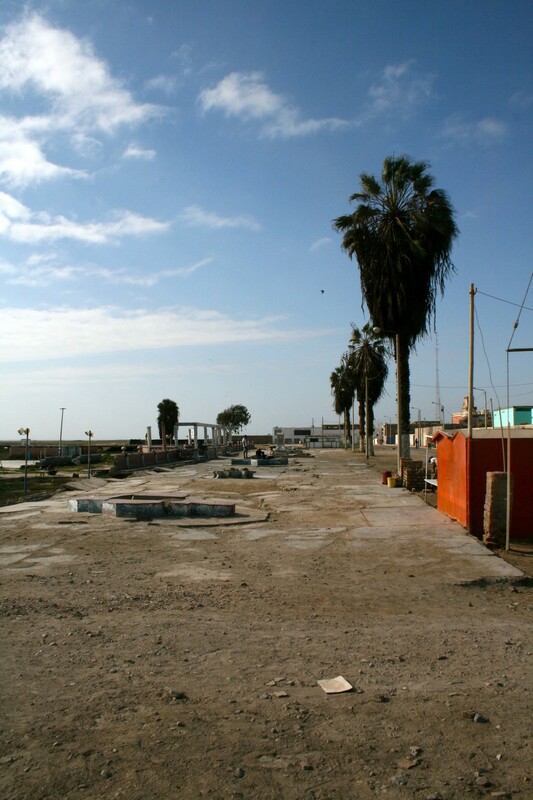 Pisco sits right on the ocean and in 2007 suffered the brunt of a massive earthquake. The damage from this quake is still very visible and this is part of the reason for the project. In our wanderings through Pisco a few places stood out. First off the hotel where Jose San Martin, liberator of Peru from the Spanish, planned the revolution! It was in a bad state basically the building was a pile of rubble a small outside bar was acting as a placeholder along with a bronze of Jose San Martin until the hotel was rebuilt. The owner assured us this would be finished in the next year, I doubt it. 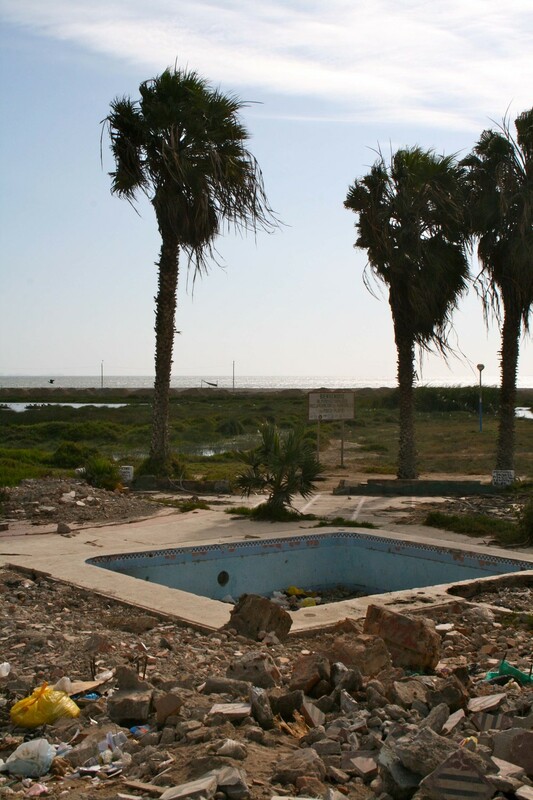 We next ventured to the Malecon or boardwalk of Pisco. This boardwalk, which at one point sported pools and fountains, was now littered with blocks of concrete and trash the ghosts of a once flourishing Malecon. Adjacent to the Malecon stretched a long pier extending well out in to the choppy surf. The pier was awesome. The old iron train rails were still on the pier from when it had been used as a commercial port. We walked out on it as far as we could the vibrations from the ocean could be felt rocking the pier back and forth creating a slightly uneasy feeling similar to that of an earthquake. Though we were a day early we were able to see some of the work that had been completed. There was a small photo exhibit showing old Pisco versus post quake Pisco. This was pretty interesting just to see what Pisco, at one point a contender to be the capital of Peru, had looked like. But it seemed hastily put up and image quality was low. Easily the most prolific art was a stencil piece that featured a mirror in its center and the word 'Presente' or present in english. This piece popped up all over the place and I think we all thought it was good and what we expected of the show as a whole, a bit more quantity more 'Presente'. That said we were a day early. Finally there was a cool little painting on a wall that was otherwise covered with posters and propaganda bits. I think this was the most effective of all that we saw. 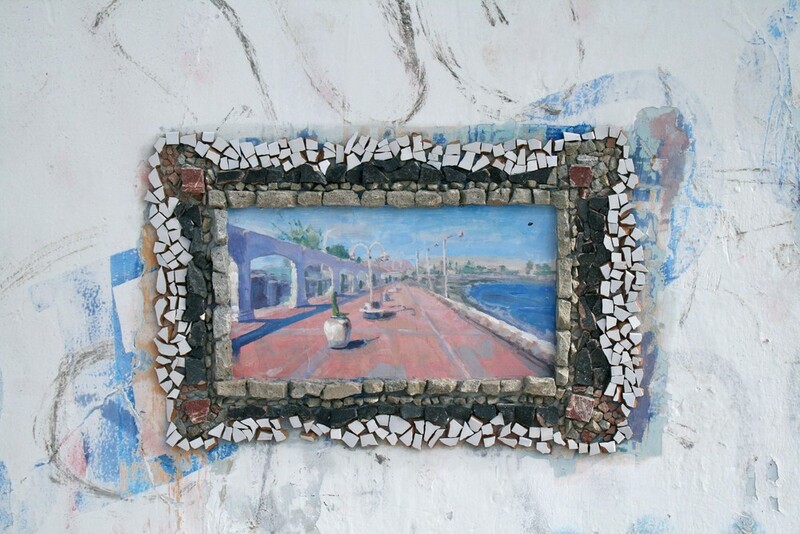 It was small and inconspicuous depicting the Malecon in its glory days. 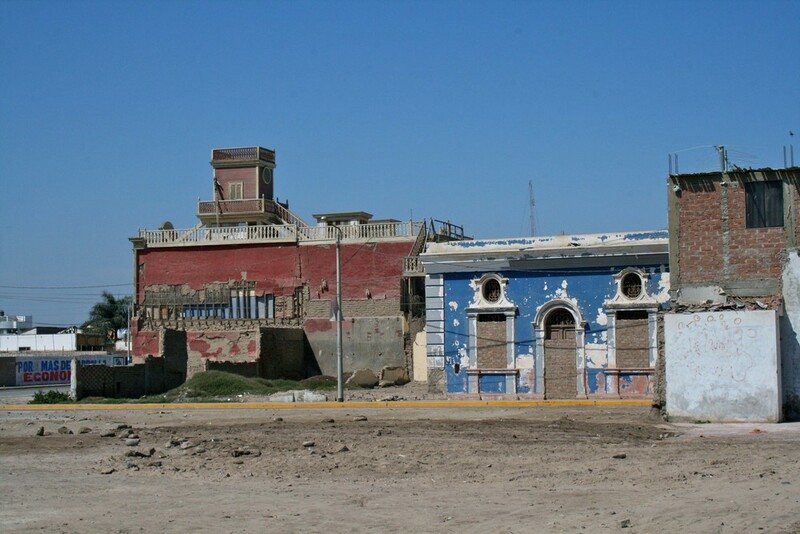 The fact that it was on a wall which stood on the current dilapidated Malecon added greatly to its impact. 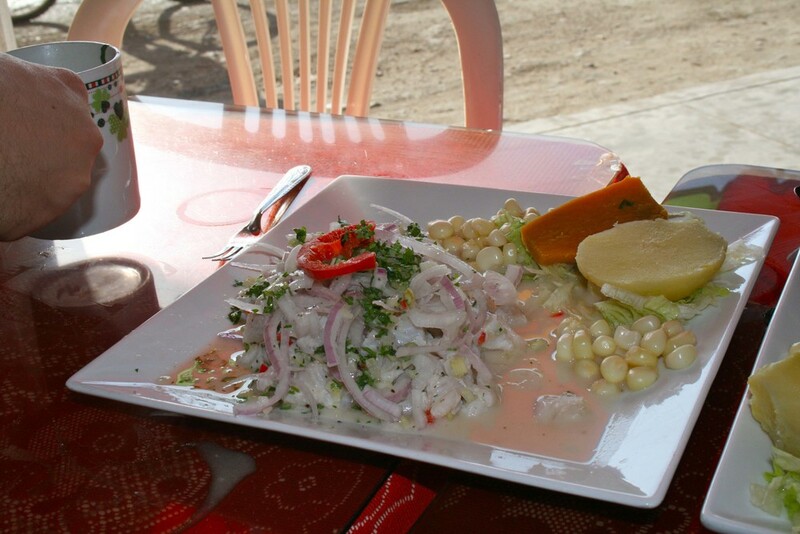 To top off the day we headed to a small cevicheria that was conveniently located directly across from the fish market. We were heartily greeted by the proprietress who seated us with gusto. Music blared out of the restaurant as the late afternoon sun streamed in. Tall cold beers arrived and popped open as if by providence. The cook, a cross between a body builder and a peruvian Richard Simmons, skipped the traditional use of a menu and brought out the fresh caught fish he had on hand! This was followed closely by a steaming mug of soup that tasted like a fish had been wrung out and then 1/2 kilo of salt stirred in. He called it Leche de Tigre otherwise known as peruvian viagra. It was hard to drink no pun intended... The cevichi arrived and more beers were cracked, what a day. The only thing missing was more pisco which was strangely absent given the towns name. Well we had one pisco sour during a break from all the art earlier on. If Pisco was the canvas for the AFUERA project it was one that trumped the art work itself. 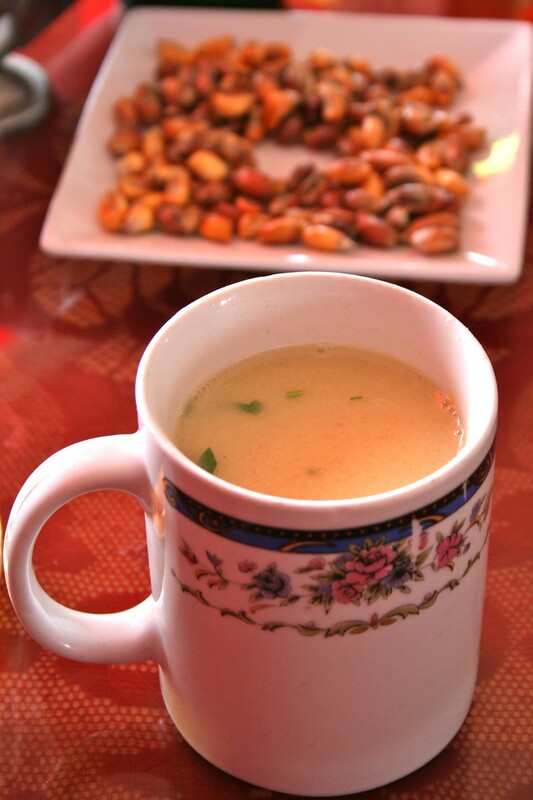 Which I imagine was one of the goals of AFURA, to bring Pisco to the forefront. We would not of gone down to Pisco and roamed its streets if it were not for this project and I know a lot more about Peru because of it. Would I have liked to see more art sure but hey we were a day early. I'm learning here in Peru that things never ever get started on time let alone early. Next up Printing the AFUERA prints, the AFUERA art show in Lima, and more Leche de Tigre action!